Steve Ballmer isn’t the only tech industry CEO in the giving spirit as of late. 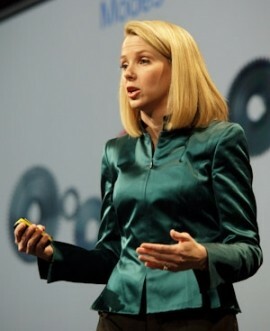 New Yahoo chief Marissa Mayer recently informed employees they would be allowed to select a new smartphone and that Yahoo would even foot the monthly bill for voice and data service. Employees in 22 countries can now choose a handset from Apple, HTC, Nokia or Samsung including the recently announced iPhone 5, the Galaxy S III, HTC’s One X or Evo 4G LTE or Nokia’s Lumia 920. The CEO says she wants her employees to have devices similar to their users so they can think and work as the majority of their customers do. Noticeably absent from the list, however, is Research in Motion. The company’s BlackBerry was once the go-to handset for business-minded users around the globe but that’s no longer the case. As CNET suggests, Mayer’s decision to move away from RIM’s BlackBerry as their corporate phone could signify to the industry that she believes the Canadian telecommunications firm won’t be pulling off any sort of miraculous comeback and that they are essentially dead in the water. It’s a sentiment that is painfully obvious when looking at market share, too. RIM’s market share sat at 25 percent just a year ago and is now just over a single percentage point according to recent data from research firm Chitika. Mayer’s memo, published by Business Insider, said the program would start right away so employees can place their orders immediately. As of writing, Yahoo has yet to publically comment on the program.